After WWII, GIs returning home wrote to Dodge and asked "where can we get a truck like the ones we used in the war"? Dodge responded by building the Power Wagon. Virtually unchanged from its introduction in 1945, to when its domestic sales ended in 1968. The Power Wagon is THE classic four-wheel drive truck. 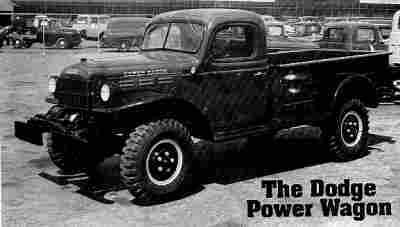 The Power Wagon was similar in design to the 3/4 ton weapons carrier, with a 126 inch wheelbase, closed cab similar to the Dodge VC series trucks, and the front shell and grill similar to the T234 3/4 ton built by Dodge for the Chinese Army, also known as the Burma Road truck. A pickup box was designed that measured 8 feet long by 4 1/2 feet wide by 22 1/4 in high. Rumor has it that the truck was named "Power Wagon" after a trucking magazine with the same name. Dodge factory-built this four wheel drive truck over a year and a half before the Willys 4T and 10 years before other manufacturers began producing 4x4 trucks, making it the first mass produced civilian 4x4 truck. Over the years, changes were made to the original truck including a 251 cid engine to replace the original 230 cid, synchromesh transmission, alternator and 12 volt electrical system, to name a few. Many custom bodied Power Wagons were put into service as fire trucks, school buses and stake bodies. One of the finest examples of this is the custom Cantrell-bodied four door woody station wagon - the original Dodge Sport Utility Vehicle. In 1957 Dodge introduced another line of four wheel drive trucks, also known as Power Wagons. These have the model designation W100, W200, W300, W500. These trucks were more conventional in styling and were available with different engines, including V-8s. A total of 95,145 WDX-WM300 Power Wagons were sold	from 1945-1968. Exports continued through 1971, and limited sales continued through 1978, with versions that included slant 6 engines, and hanging pedal assemblies.